afternoon to a missionary meeting and supper which was very pleasant. We were at Hatties for a call and I went to see Esther to invite her over tomorrow. I helped some with evening work and went to bed early. Saturday May 3rd 1890 Mother and I gave the house a good cleaning up this morning. I went over to Marys for a little while and Will went on to the pasture. Edith came over for the day and stayed all night. Fanny was here in the morning for a call and Marys girls late in the afternoon. Esther and Mrs Connatt spent the day here and we had a splendid visit with them. Mother went over to Marys late in the afternoon with Edith a little while I am ripping out our fly net I made last year as the mice spoiled it so I have to make it over. Sunday May 4th 1890 Mother and Winnie both went to church and I was busy about the work. We got up very late as Stiles and Pierce were over to Mt Vernon and did not get home till late in the night. I did not hurry the breakfast. It rained so Mother did not get home. I read a little in the afternoon and took a nap. Frank Stackman was here most of the afternoon with Will. Laurence has a brother visiting him. I wrote in the morning. Monday May 5th 1890 There was a cold wind and a cloudy sky this morning. I was busy about the house most of the forenoon and Mother and I worked most of the afternoon making garden. Winnie mowed the yard. We were very tired tonight. 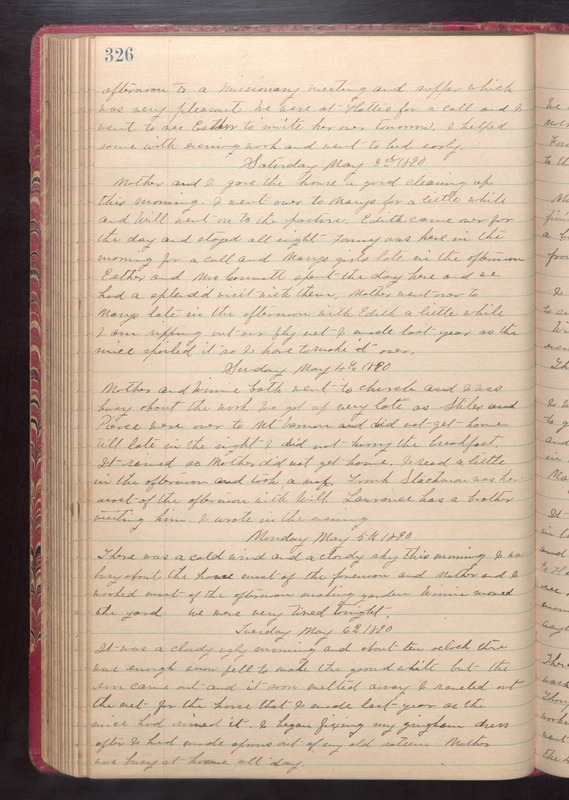 Tuesday May 6th 1890 It was a cloudy ugly morning and about ten oclock there was enough snow fell to make the ground white but the sun came out and it soon melted away. I [raveled?] out the net for the house that I made last year as the mice had ruined it. I began fixing my gingham dress aftyer I had made aprons out of my out [sateen?]. Mother was busy at home all day.